Dynamotive Energy Systems Corporation is a small but dynamic publicly-traded Canadian company led by former oil trader Andrew Kingston. Kingston’s vision over the last decade as the CEO was to produce renewable energy from waste biomass rather than from food crops. With his grounding in the oil business, he realized early on that a robust distributed supply chain would be integral to the company’s success. The company’s search for under-utilized waste led them to Erie Flooring and Wood Products, in West Lorne, Ontario, where piles of hardwood sawdust and wood chips could provide the ideal feedstock for Dynamotive’s patented fast pyrolysis process. Today, Dynamotive’s West Lorne pyrolysis plant has the capacity to process about 130 metric tons of dry biomass per day. 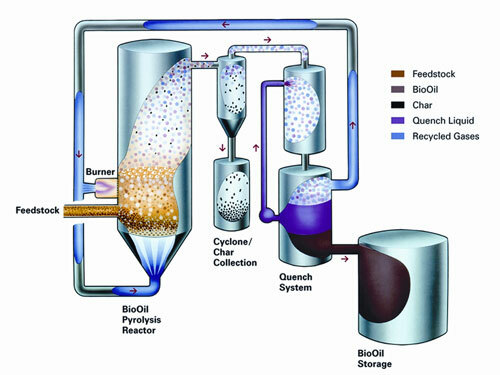 The yield from the fast pyrolysis process of sawdust is about 70% bio-oil, 20% biochar and 10% syngas, which is recycled to provide fuel for the burner to heat the pyrolysis reactor. Dynamotive has built another plant in nearby Guelph with a 200 ton per day biomass capacity—which is still relatively small in comparison to competing biofuel technologies using cellulosic feedstocks. According to Dynamotive executives, one of the advantages of the fast pyrolysis technology is that it can economically produce a liquid fuel in a smaller sized facility than would be needed to produce cellulosic ethanol. Economies of scale require that cellulosic ethanol plants be able to process 3,000 to 5,000 tons of biomass per day. However, the economics of transporting widely dispersed biomass feedstock to processing plants favor smaller, more localized facilities. For this reason alone, fast pyrolysis may turn out to be a better bet for liquid biofuels than cellulosic ethanol. 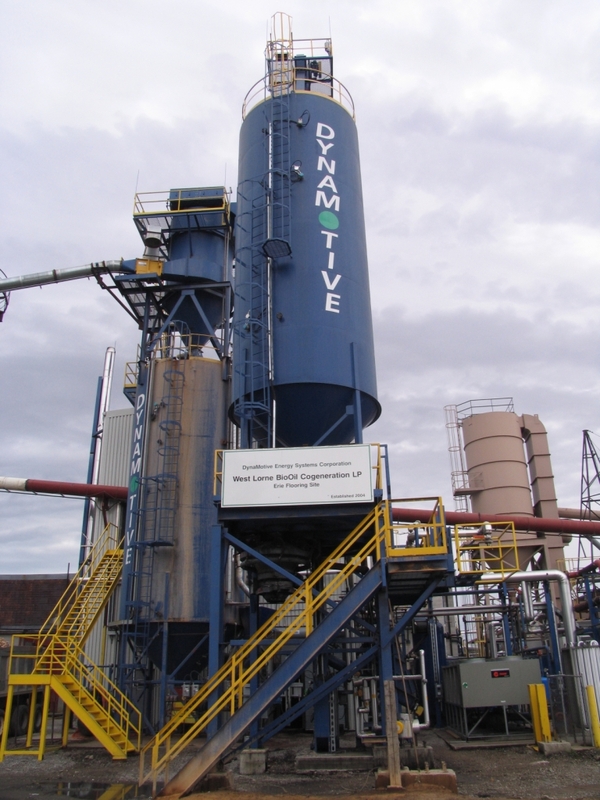 Dynamotive was one of the first bioenergy companies to recognize the importance of biochar. The company was one of eight sponsors of the First International Agrichar Initiative (IBI before its name change) Conference held in New South Wales, Australia in 2007. Dr. Desmond Radlein presented “The Role of Agrichar in the Commercialization of Dynamotive’s Fast Pyrolysis Process” at that conference, describing the need to turn the char byproduct from fast pyrolysis into a commercially viable product. 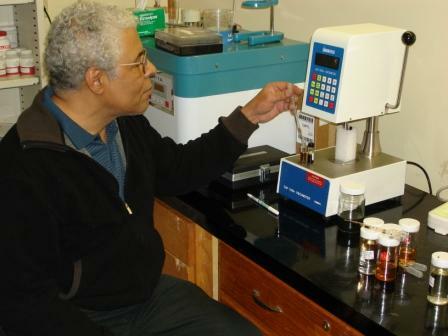 Dynamotive has done its part to develop the market for biochar by stepping up and providing biochar to researchers at a time when the material has been hard to come by. Some of the research groups supplied include the USDA Agricultural Research Service (investigating soil enhancement properties for several climates/soils/crops) with Dr. David Laird; the Flux Farm Foundation in Colorado (investigating soil enhancement for pastureland) with Morgan Williams; the University of Idaho (enhancement of forest soils) with Dr. Mark Coleman; and Fleming College in Ontario (wastewater cleanup) with Dr. Brent Wootton. Dynamotive has also supported its own field trials such as the one conducted with Blue Leaf, Inc. (see the Blue Leaf Practitioner Profile). While Dynamotive has only provided CQuest to locations in North America so far, Bouchard said that it is possible to ship overseas. Biochar is defined as Class 4.2 “flammable solid” so it must be transported by land/sea. CQuest is typically packaged in steel, sealed drums each containing about 120 lbs of product. For more information on Dynamotive, please see www.dynamotive.com.